10to8 online booking system can manage those cases where you and your client live in different timezones so that you don’t have to do the math! 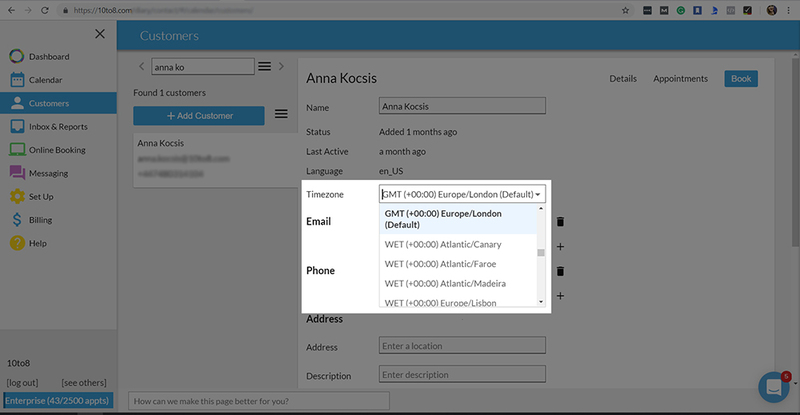 If you add a new customer on the Customers tab within the product, you can now specify which timezone they are in. This allows 10to8 to send them SMS and emails with the correctly formatted time for the appointment. Get this right to avoid no-shows! For bookings initiated by your customers, 10to8 already gives them the option of choosing their own timezone. All successful businesses take care of their online presence, to make sure that it reflects the values and image they want to portray. This feature is only available on Bespoke Plans. 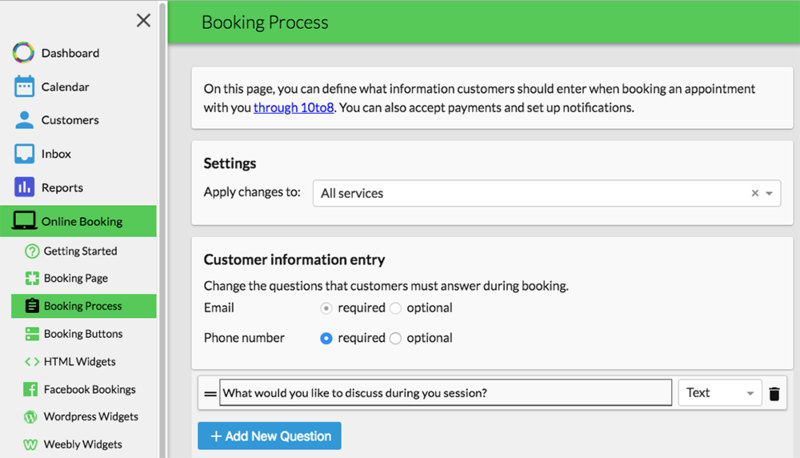 You can now change the questions that 10to8 asks your customers before they place a booking with you, and you can have different questions for each service that you offer. 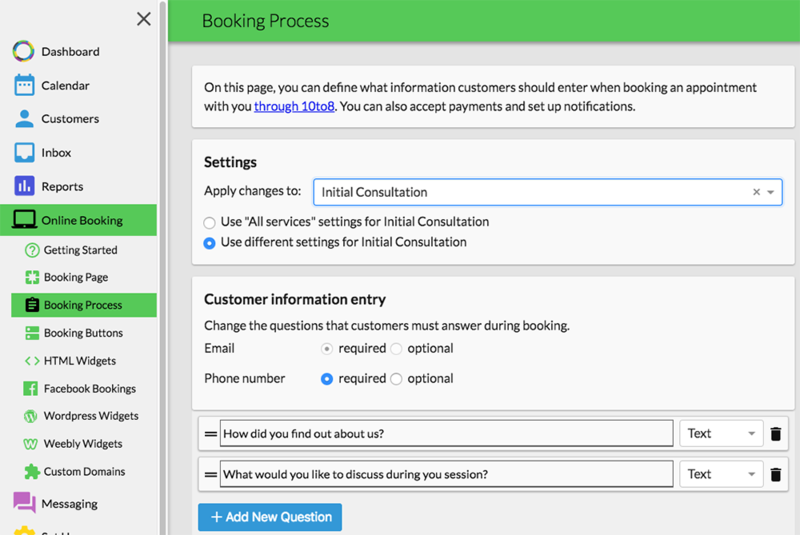 This allows you to tailor the customer experience for each user so that the booking process is more personal and you can avoid asking irrelevant or repetitive questions for returning customers. For example, you might want to ask customers what they would like to discuss during their sessions with you. However, you are also interested in market research, so for their Initial Consultation you can ask them how they found out about you, but selecting the “Use different settings…” option for that service. You would not want to ask this for every single session! We’re really excited to see how our users make the most of this. Let us know how you get on with this feature. This feature is a bit more advanced and only available on Bespoke Plans. To find out more, reach out to our support team via help@10to8.com. 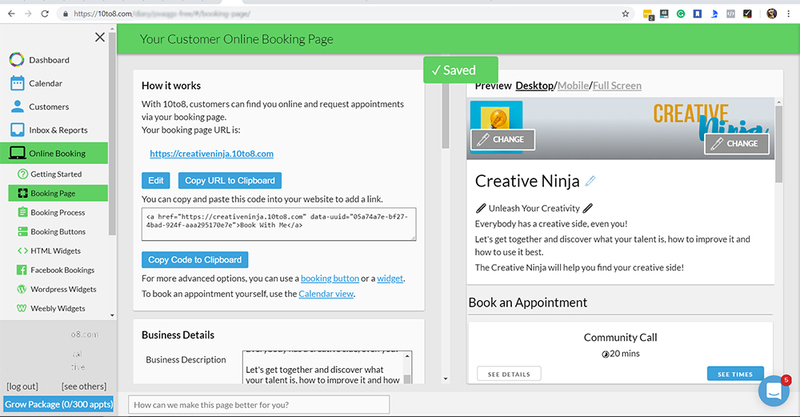 10to8 online booking system can now take multiple bookings for the same member of staff at the same time, up to a limit that you can choose. For example, you might arrange deliveries. You can not guarantee a delivery time, so instead, you schedule 5, all of which to take place “between 9 am and 1 pm”. Normally, 10to8 only allows 1 booking at a time, but you can now increase this limit. Your clients can even schedule their deliveries online, and the system will stop once the 5 slots are full. Another potential use would be for medical appointments, where several people are scheduled to be seen at 9 am, and then form a queue until a specialist is available. This is different from a class – classes are when a member of staff carries out a particular service with multiple attendees. With this new feature, the staff member can be carrying out many different services at once, even with potentially different start times for each client. Which feature do you like the most this month and what would you like to be released next month? Let us know in the comments! Get All The Premium Features You Need! Missing out on features on the free plan? 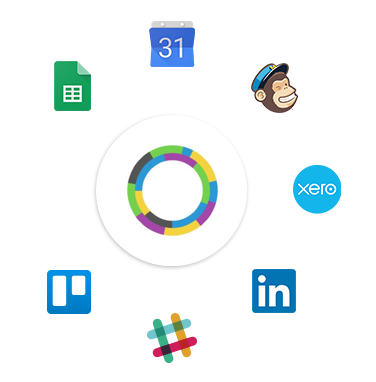 Unleash the full power of 10to8 and benefit from more features than ever before. Take your business to new heights when you upgrade today. Richard is the MD and a director of 10to8, responsible for day to day running of the company. He has been with 10to8 for 4 years, joining after completing a PhD at Oxford. Richard previously worked in the City, and at several technology companies and startups.